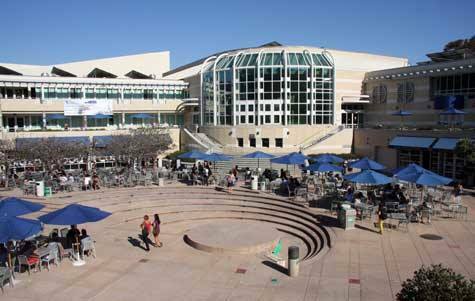 UCSD Price Center. Photo credit: UCSD/Facebook. Senate Democrats unveiled a proposal Tuesday that would eliminate a planned tuition hike for in-state students at UC San Diego and other University of California campuses, but would sharply increase the amount out-of-state students pay. The UC Board of Regents last month approved tuition hikes of 5 percent a year for five years, saying it wasn’t receiving enough money from the state to even cover inflation. The decision has sparked protests at UC campuses across the state. Under the proposal announced by state Senate leader Kevin de Leon, D-Los Angeles, out-of-state UC students would see a 17 percent increase in their tuition premium, while the state would also boost its general fund spending on higher education by $156 million in 2015-16. The proposal also calls for redirecting funds from a middle-class scholarship program. The plan would also create a financial incentive program for California State University students to obtain their degrees in four years. “I welcome and applaud the Senate Democrats’ interest in maintaining the excellence, access and affordability of California’s system of public higher education,” Napolitano said. “The bill introduced today is a promising first step toward making sure that public higher education benefits Californians today and for generations to come, and we look forward to working with Senate Democrats and other elected officials to secure the state funding essential to this end. Under the tuition hike approved by the UC Board of Regents last month, in-state tuition for the 2015-16 school year will rise by $612, to $12,804. Out- of-state students pay the same increased rate, plus the non-resident fee of $22,878, which will also increase by the same percentage, according to UC. Napolitano has said she hoped the plan will offer some stability to students and gradual, predictable increases instead of possible large spikes in tuition — eliminating “volatility” in the tuition-setting process. She also expressed hopes that it will spur the state to boost its funding of UC.